At Operation Maths we are constantly looking for ways to improve the usability of our programme, and to make it even more teacher-friendly. The most recent additions included long term plans for various combinations of multi-classes as well as excel versions of our Assessment Records. Following on from feedback from teachers, we have now expanded the original version of the latter, released in October last, to include all the assessments for the entire school year, as well as incorporating extra features designed to make them even more teacher-friendly. Use these attainment scores to compare the attainment of various individuals and/or groups of children and identify children in need of further support (Assessment for Learning). Quickly get a score for each learning outcome, use these scores to identify the strengths and weaknesses of the class as a whole, while also being able to identify which learning outcome(s) require further consolidation (Assessment for Learning). Each of the five assessments ( eg End of October, End of December etc ) has a dedicated page; click the tab at the bottom to move between them. Teachers need only enter the children’s names once only on the first page; the inbuilt formulas then copy these names to the other pages in the document. Under each child’s name, the teacher can enter a score for each question (or page in junior infants); see more below for a suggested scoring system. The score for each individual question (or page) will be automatically totaled (horizontally across bottom) to give an attainment score for each child. When all the scores have been entered for each child, these will also be totaled along the right-hand side vertically to give a total for each learning outcome. After the five assessment tabs, there is a tab entitled “All”. Here all the scores from each assessment will be automatically replicated, once entered on the original assessment tab. This allows the teacher to easily view all the data in one screen. The scores for each child will also be totaled here to give you an overall score. Other useful information provided includes the specific strand and strand unit (S.SU) to which the learning outcome relates. These are abbreviated and a full explanation of the abbreviation is given on the last tab. HINT: If you already used the version of this document released last October, it is now recommended that you download and use these documents for the remaining assessments. They also include a page for the End of October Assessment, allowing teachers to copy and paste in the October Assessment scores, so as to have all the information in the one document. Obviously, teachers will have to apply any scoring system in a flexible way; for example if there is a question that requires just one response and is therefore is either correct or incorrect, then only 0 or 4 will be awarded. a total attainment score for each child; the higher the score the more learning outcomes achieved. the means to sort and/or compare the attainment of various individuals and/or groups of children using these total attainment scores and identify those children with the lowest scores as needing further support. the means to to identify the strengths and weaknesses of the class as a whole by sorting/comparing the total scores for the learning outcomes, while also being able to identify which learning outcome(s) would benefit from further teaching. You may notice that these are still BETA versions only. This is because we would welcome more feedback on the usability of these documents. Feedback can be left on this Edco Primary Maths facebook post or messaged to Edco Primary Maths. Did you find the excel document(s) useful? Did you find the scoring system useful? What suggestions would you make to improve them? Spatial awareness…being able to describe the position of something/someone in relation to another using words and/or gestures, and being able to represent spaces and locations using models and/or drawings, may, at first glance, appear to have more in common with communication and geography, than with maths. However, the concepts of spatial awareness lay the foundations for all geometric thinking, be it at upper primary, secondary or an even higher level. The spatial relationships between objects and places can be described and represented. These relationships may be viewed, described and represented differently depending on the perspective of the viewer (in particular, consider left and right). Developing the ability to mentally visualise the representations will enhance a person’s ability to picture how a shape will look when rotated when turned, flipped etc. In the case of the practical problems, this could include completing a jigsaw or a tangram puzzle, using mazes, grids, board games and or exploring basic coding eg via coding programs and apps, such as Lightbot, and more hand-on devices such as BeeBots. Since spatial awareness requires an understanding of using space and moving through space, the majority of the activities should be active ones, where the children are moving around. This is where the suggested activities in the Operation Maths Teachers Resource Book (TRB) become extremely useful, such as the examples below. Much of the language development in this strand unit can be reinforced via activities in PE (Orienteering) and Geography (mapping). While activities incorporating physical movement are preferable, the Operation Maths digital resources on edcolearning, provide a worthwhile alternative and add variety. The Ready to Go activities below, as the phrase says are “exactly what they say on the tin”; the teacher need only click on the relevant icon in the digital version of the pupil’s book to open the activity, and the accompanying suggested questions are quickly viewable along the side menu. A full description of the activity, including the questions, is also given in the TRB. Why above/below is easier to learn than left/right: a blog post, that illustrates the importance of perspective quite well. Welcome to the fourth installment in this year’s series of posts designed to explore the Operation Maths topics on a month-by-month basis, giving teachers greater insights into the concepts at hand, when they are most relevant. While each monthly overview will specifically zone in on the Operation Maths topics for that particular month, the information and suggestions will be relevant to ALL primary teachers, whether they are Operation Maths users or not. HINT: To ensure you don’t miss out on any future Maths by Month blog-posts, please subscribe to the Operation Maths blog via email, on the top right hand of this page. Senior Infants: 3D Objects, Spatial Relations and Time (the days of the week). First Class: Money, Place Value within 20, Patterns and Capacity. Psst! Teachers of Infants to Second Class: work is well underway on the Excel Record Spreadsheets to accompany the rest of the assessments in the Assessment Booklets; if you have any suggestions for how to improve these, please leave them here. Operation Maths users can also access a class specific, month-by-month list of relevant links and online resources via the Weblinks document, accessible on www.edcolearning.ie. Click on the At School Book/Pupil’s Book for your class level. Select Weblinks from list of categories and then click to download the document. Also accessible on www.edcolearning.ie. are the custom-made digital resources to support these topics. These will all be viewable when you click on the Edco Resources icon as directed above. Don’t forget that Operation Maths also has you covered for planning whether you’re teaching a single class or multi-class. NRICH have recently launched their 2018 Primary Advent Calendar. They have lots of other Christmas-themed activities that can be accessed here: https://nrich.maths.org/public/search.php?search=christmas. They also have an Advent-themed sudoku challenge that some of the more able senior class pupils might like to tackle. Mash-up Maths have a Christmas-themed 12 Days of Holiday Math Challenges. 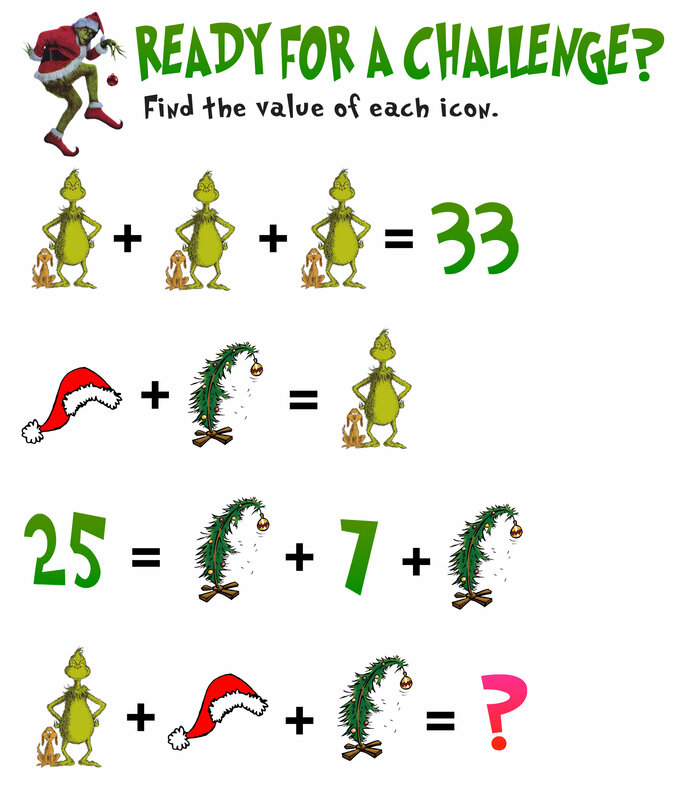 Sign up to the Mash-up Maths weekly newsletter to receive lots of other themed maths puzzles and challenges like this Grinch-themed challenge that was emailed last week.